Remember that time I ate fourteen protein muffins in one day? Probably not because it just happened yesterday as I made these pumpkin banana bread muffins. Half of my indulgence was related to general testing and the recipe development process, while the other half was pure indulgence as these muffins are to die for. No muffin with over 10 grams of protein should be so moist and tender. And with chopped walnuts candied with brown sugar and butter on top, these protein muffins are seriously bananas. 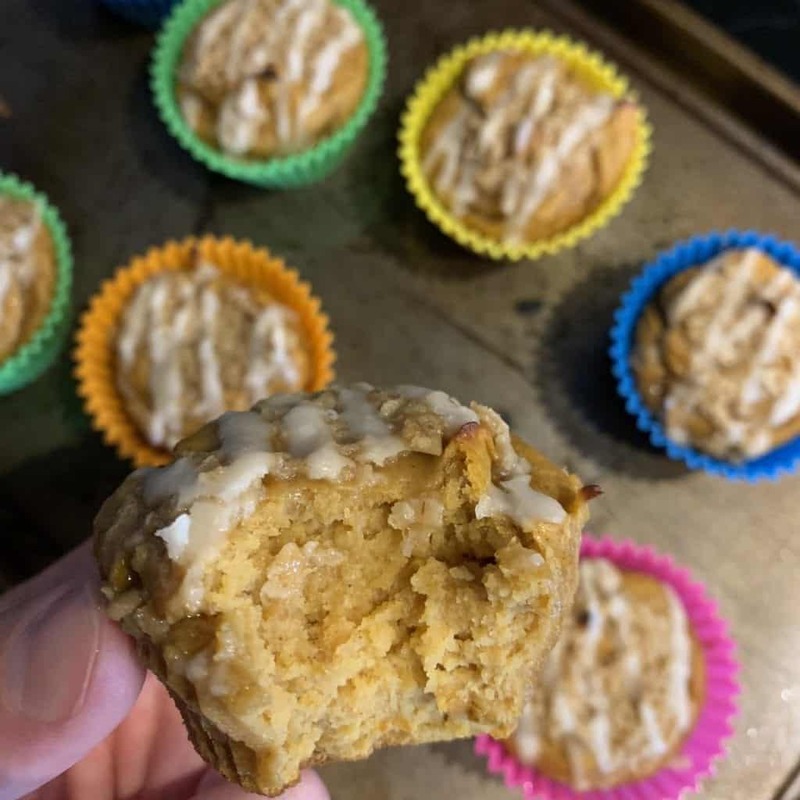 While the ingredient list for these protein muffins might be a bit longer than my usual recipe, don’t mistake that for it being a difficult recipe. You can throw everything in a food processor and be in the oven in about five minutes if you’re quick. There aren’t many ingredients you’ll want to modify, but I’ll mention I used PEScience Whey and Casein Protein Powder for the original muffins. Though I’ve since updated the recipe card’s notes to include a modified recipe for my Bowmar Nutrition protein users. I’d give it my A+ rating, even though that’s not a real thing. I’d also like to say I’ve finally converted to these silicone baking cups after my cupcakes and muffins stuck to one too many paper liners. They’re easily the best $6 purchase I’ve made in the past few months. 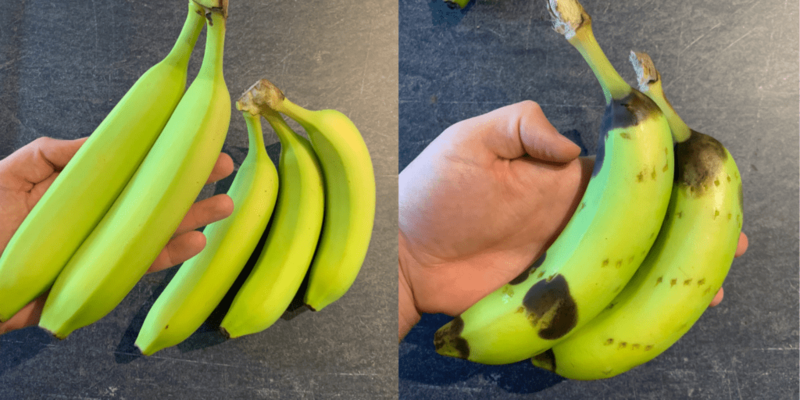 I told my Instacart delivery person to grab the ripest bananas they could find but they must’ve read that wrong (or I haven’t been tipping enough) because I got neon green bananas. Alas, the show must go on. A few stabs of a fork, a minute in the microwave, a few minutes in the refrigerator, and I had semi ripe bananas. This is obviously an extreme example and I wouldn’t recommend using bananas fresh off the vine (er tree? flower?) for your protein muffins. There’s no replacement, especially in terms of flavor, for an overripe banana. But if you have pretty ripe bananas and want to take it to the edge, try 30 seconds in the microwave. 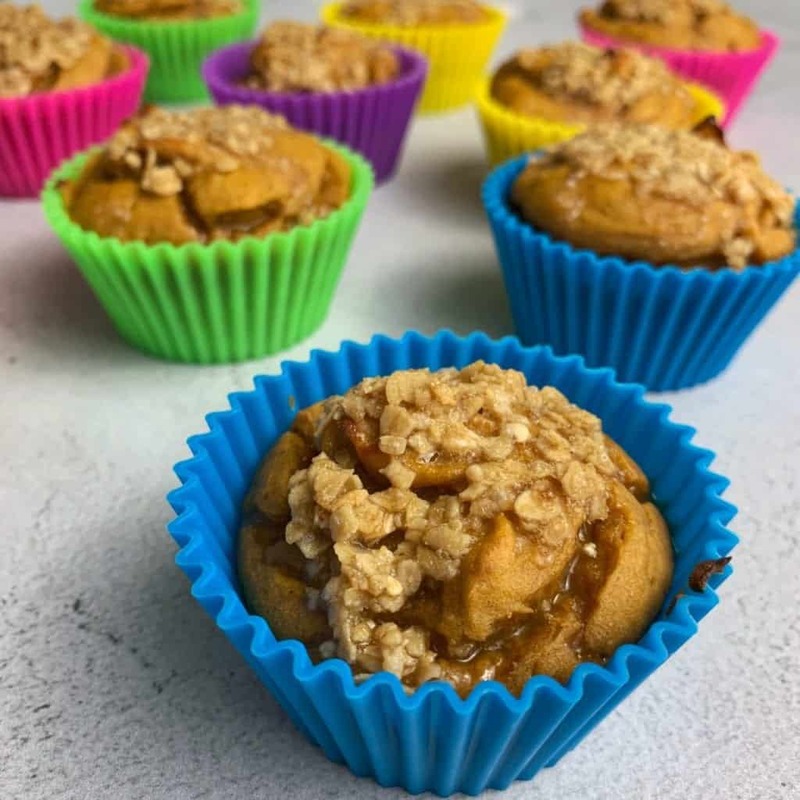 I went back and forth on adding anything to these protein muffins but eventually decided they’d be much prettier with a streusel or topping of some kind. Gotta do it for the ‘gram, ya know? 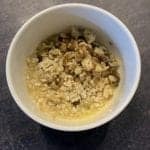 For the streusel, I used a few usual suspects like light butter, quick oats, and chopped walnuts. The new kid on the block is Swerve Brown Sugar which I used for my Korean Ground Beef recipe. If you’re familiar with my sweets recipes, you’re aware of my affinity for Swerve Confectioners Sugar. I’d like to report that their brown sugar substitute is a certified game changer as well. Similar to my points on protein powder above, however, I’m not affiliated with Swerve and don’t have to sell you on it. (Though they did send me the brown sugar for free. Thx guys!) If you wanted to use something else, I think reducing the butter and using a bit of Walden Farms Pancake Syrup or a sugar free syrup with the quick oats and walnuts would work great. As for the sugar free glaze, I used more or less the same glaze from my Apple Pie Protein Donuts and Apple Pie Baked Oatmeal Cups recipes. It’s a bit challenging to replicate this glaze without powdered sugar of some kind. So if you didn’t want to use Swerve Confectioners, you might just go with 1-2 tablespoons of real powdered sugar. Or leave the glaze off entirely. They’re scrumptious without it. That’s all the ingredient notes I have for you. 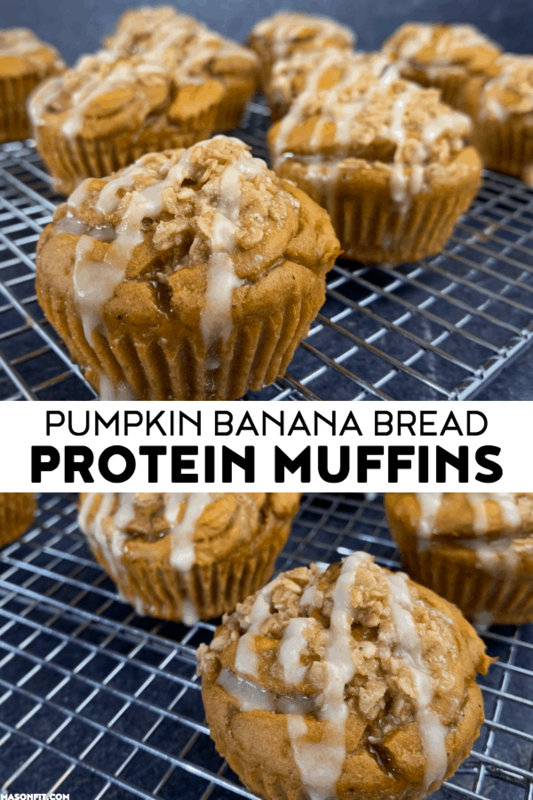 I hope you enjoy your pumpkin banana bread protein muffins! If you do, take a snapshot and tag me on Instagram to receive 10,000 brownie points in my book. 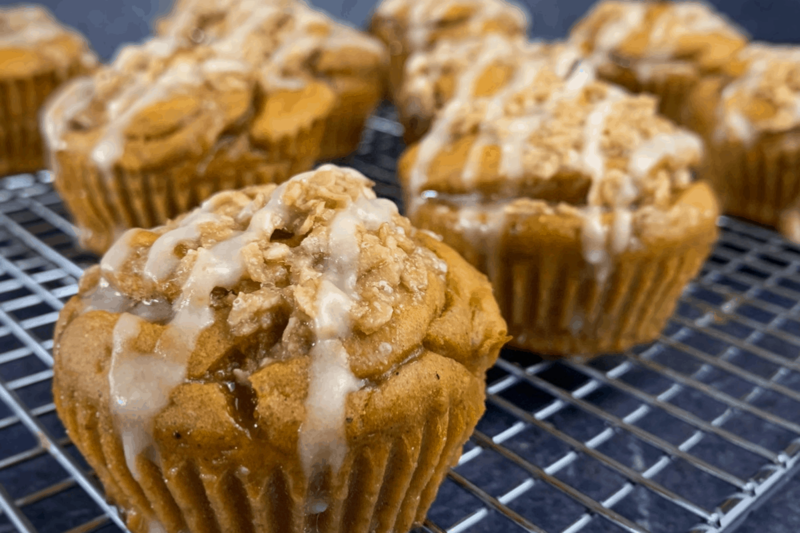 A recipe for super moist protein muffins with a candied walnut streusel and sugar free glaze. Preheat oven to 350F and spray a 12-muffin tin with nonstick cooking spray or place 12 silicone baking cups on a baking sheet. Use a large spoon to transfer the muffin batter to the muffin tin or molds. Each one should be nearly full. Spoon the streusel mixture over the top of the protein muffins. 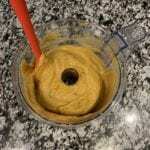 The recipe as-is makes super moist muffins. If you'd like more structure, use two bananas instead of three. 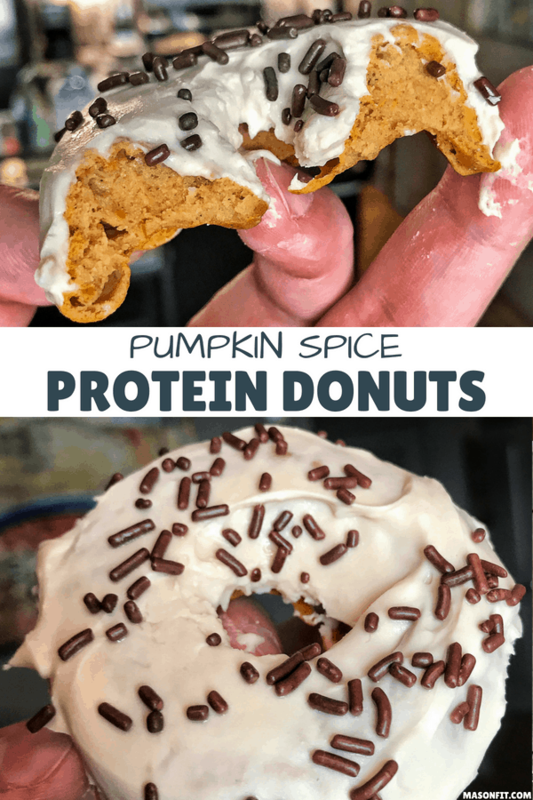 My pumpkin spice protein donuts have 95 calories and nearly 13 grams of protein each. 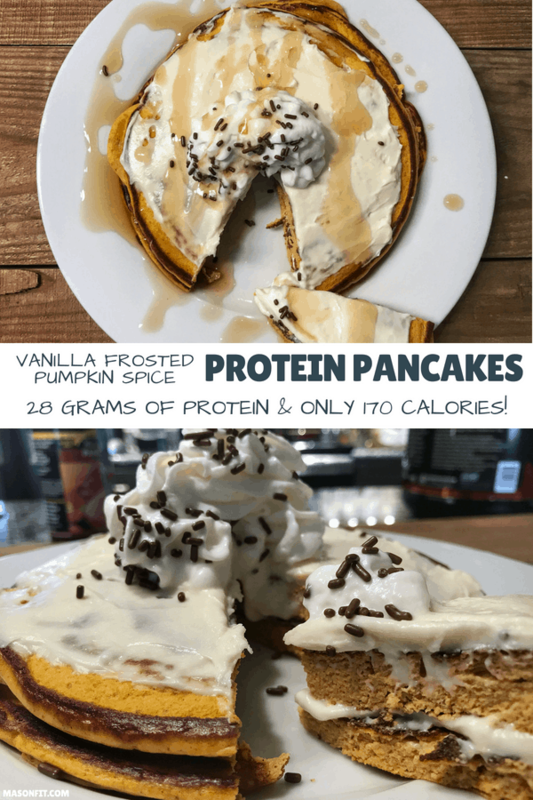 And these pumpkin spice protein pancakes have ridiculous macros as well. Looks amazing! Do you know anything that could be used as an alternative to Graham Crackers? I believe any sweet cracker or crisp should do the trick. I’ve also had a few readers mention using crushed cereal which I think is genius. I’ve used crushed cereal for things like my Kit Kat protein pancakes (https://masonfit.com/kit-kat-protein-pancakes/) and Cap’n Crunch protein donuts (https://masonfit.com/crunch-berries-protein-donuts/). Hope that helps! I made these without either of toppings and they were super tasty! I just put a little bit of honey butter on top. Yum! I tried making this with a different brand of protein and they came out too dense. I will for sure try it again now that I have PE Science vanilla! These are soo freaking good I made some for me and my sister and we both loved them! I used the Snicker doodle pes protein powder because that’s all I had on hand and I think it came out awesome. Next time i’ll for sure pick up some vanilla so I can try it the way it’s supposed to be made. I also didn’t have silicone muffin cubs so I just gave my tin a little non stick spray and they came out perfect. I’ve made these the last three weeks in a row to add to my meal prep lunches. They are so delicious, even without the glaze. Used the microwave banana trick the first time I made them and it worked like a charm! This was truthfully one of the most delicious healthy recipes I’ve ever made. I started making this recipe into a bread instead of muffins and it was amazing. Well done! These muffins were so moist I could not believe there was protein in them! I loved that there was no added sugar and they were so delicious and sweet from the bananas. 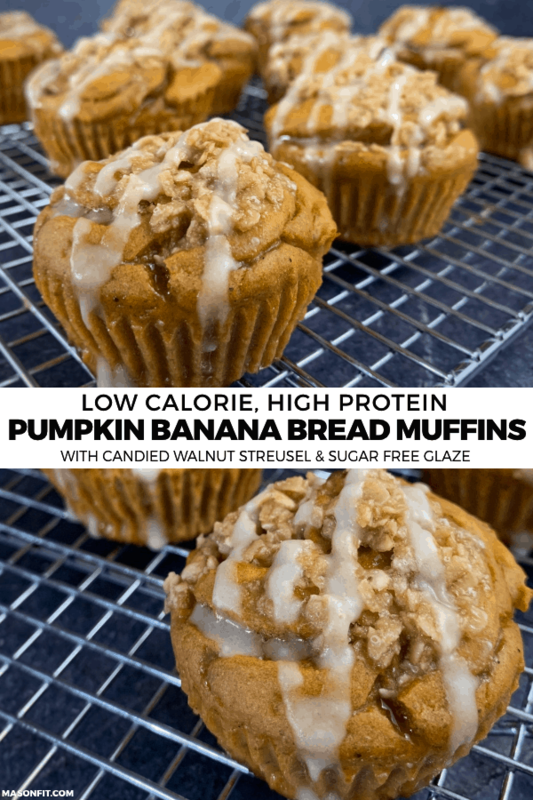 I made these last night and am planning to make another batch after work since I already ate 5 muffins since I made them! These kind of reminded me of the healthy banana bread recipe which I love. So needless to say these were just as good. I love the taste the pumpkin gives. Its subtle but perfect. The frosting or glaze I should say is everything! I would have never heard of Swerve Confectioners if it wasn’t for Mason. That thing is a game changer. These muffins are a game changer!! You need to make these and try not to eat them all. It’s HARD!! I just realized I made these and totally forgot the graham cracker crumbs….they are still super yummy. I was thinking I’d go with only two bananas next time so they’re not so moist but perhaps I’ll just remember the graham crackers and see how that goes!! I made these and left the streusel out because I don’t have swerve. I also don’t think I used the right kind of protein or I overcooked them because they came out super dry. Cannot get enough of these muffins!!! I was pleasantly surprised to find that they came out moist just like the recipe says!! So many times I make things and they are dry and difficult to eat. Not these, the whole house enjoyed them and were gone before I knew it! Will definately make again!! Amazing! I make 4 batches on Sunday and everyone in the family programs 2 a day for themselves. Huge hit! !